Is this a good photo ? Is this photo any good? Apparently it is. It seems to have been selected for the exalted status of “Explore” on Flickr, which is something I’ve never given much attention to. However, this raises it’s visibility, and therefore it gets many more visits, more comments, more favourites than ninety percent of the photos I post. 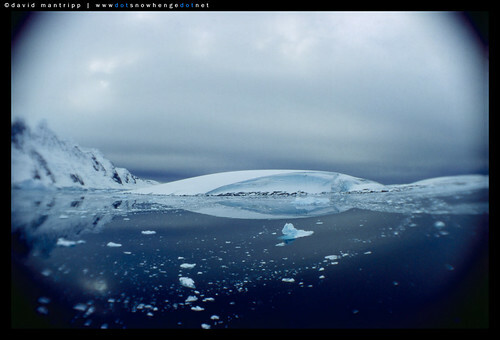 I posted it as part of by sort-of 1 photo a day Antarctic Archive project. To me it is at best a curiosity, and it completely falls apart at anything larger than the size I posted it at. It was taken centuries ago, with a Canon FT-QL camera, I think a 50mm f1.4 lens, and one of these screw-in fisheye lenses that were big when flares were in fashion the first time around. I guess the first, and probably last, reaction of anybody now is that it came straight out of Instagram. Or a Holga. But there’s no post-processing at all beyond cleaning up the scan. The file wouldn’t even take sharpening. It is totally soft, the composition isn’t even considered. Any serious landscape photographer would be embarassed to be asked to venture an opinion on it. It has an atmosphere to it, and an eerie sort of feel. It seems to touch a nerve. It’s hardly a typical Antarctic landscape shot. At best, it’s a collection of mistakes which somehow summed up turn into something interesting. But is it a good photo? I guess I’m not qualified to be the judge of that.